I’ve been playing with doll clothes. I had so much fun putting together little outfits for my article in Through the Needle ONLINE Issue #14 (October 2012). 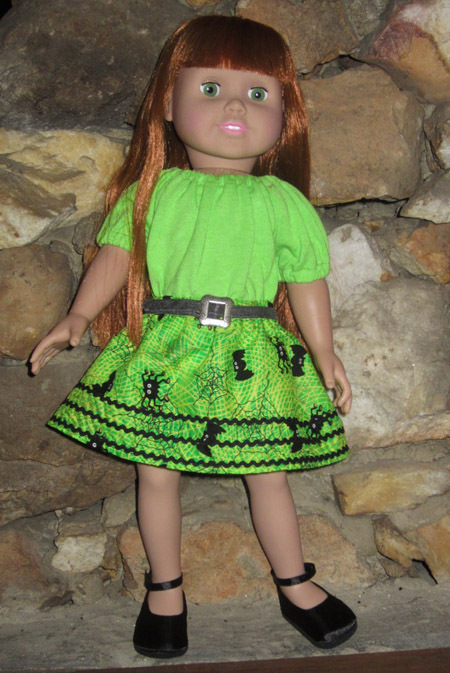 Eighteen inch dolls are so much easier to sew for than Barbie and her friends! While looking for t-shirts and sweaters to cut up for my doll clothes article, I found a big box of holiday fat quarters and half yards that followed me home over the years. Does this ever happen to you? “What a fun fabric print! Look at those cute little spiders! Oh, do I know what I’ll use it for? Well, no, but I’m sure I’ll find something.” And so dozens of novelty prints languish in their bin, hoping to be used one day. 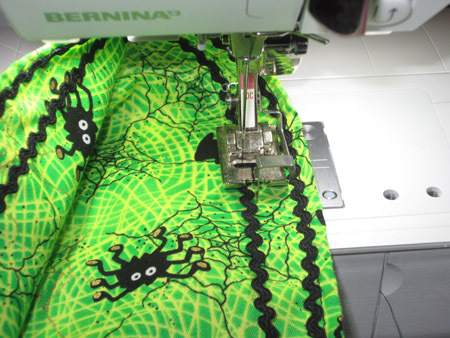 Hiding out with the snowflakes and hearts I found this electric lime fabric with little spiders and bats. I was in the middle of sewing up my 18″ doll wardrobe and thought, “Hey! I could make a skirt!” So I did. Cut out the skirt. Use the short gathered skirt pattern to cut your fabric. Apply the first row of rickrack. Starting at the raw edge, place the fold of the hem along the inner edge of the right toe of the Edgestitch Foot, and the edge of the mini rickrack with the inner edge of the guide. Adjust the needle position to the left as needed; you want the stitching to be right down the center of the trim. Go slowly! It takes a little practice to guide the edge and the rickrack at the same time. 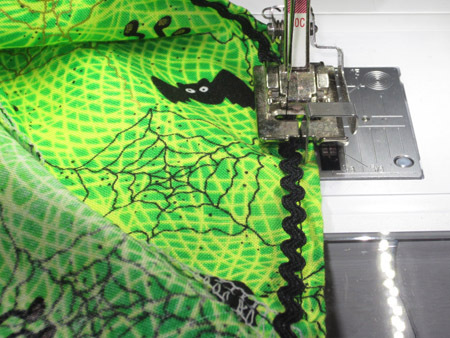 You can see a little bit of the serged and turned hem at the edge of the photo above – the serger thread is white; the sewing machine thread that holds the hem in place is black. Add more rows of rickrack. Align the outer edge of the right toe with the previous row of rickrack and the new rickrack edge with the inner edge of the guide. Readjust needle position if needed; stitch. Repeat as desired. Finish the skirt following the pattern instrluctions. To complete the outfit I used parts of a lime green t-shirt to make the gathered top included in KwikSew #K3091. 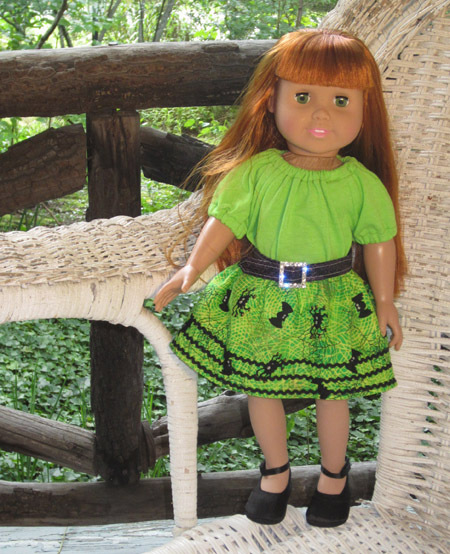 The belts are by Cinnamon Miles of Liberty Jane – see her Doll Belt tutorial for WeAllSew HERE. Love the edgestitch foot for this! Thanks!